One of the very first Steampunk books I ever read was Mark Hodder’s The Strange Case of Spring Heeled Jack, and I enjoyed it so much I knew I was destined to read the rest of the series. 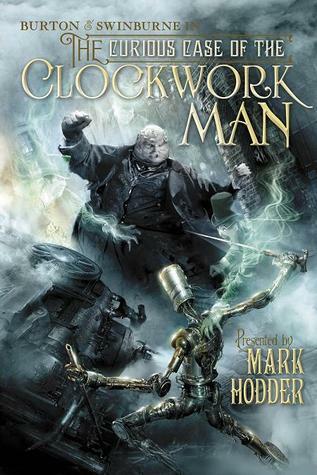 The Curious Case of the Clockwork Man picks up a few months after the events of book 1. This is an alternative history where Queen Victoria was assassinated early in her reign through the misguided attempt of a time-traveler to save his family name. Sir Richard Francis Burton, explorer turned “king’s agent” for Albert, has recovered from his injuries but is experiencing suffering of a different sort. He has spent a goodly portion of his professional life dedicated to discovering the source of the Nile River in Africa, but he is being denied the opportunity to go on the newest expedition. After an unseemly (aka drunken) display at the Royal Geographical Society Burton is being escorted home by a likewise besotted Algernon Charles Swinburne. On their way they encounter a bizarre sight. A shiny metal man has walked into a square and stopped dead. The technology in this version of 1862 is much more advanced than it was in real life, but this sort of clockwork man with a Babbage engine brain is way beyond what one would expect to see, especially seemingly abandoned on the street. In reality, it is a decoy meant to distract everyone from the real crime, the theft of a set of black diamonds said to have mysterious qualities. Burton doesn’t have long to think about this robbery before he is given his next assignment by the Prime Minister. The heir to the Tichborne family fortune has suddenly resurfaced years after he was supposedly lost at sea, but suspicion abounds. The grotesque visage of the claimant appears and seems to have a strange hold over everyone, especially London’s working class folk. Somehow a man who can barely string a sentence together has the entire city backing his claim, and it doesn’t take long before violence erupts. Could it just be the natural course of the oppressed rebelling against the upper crust, or do reports of ghosts and the undead have something to do with it? 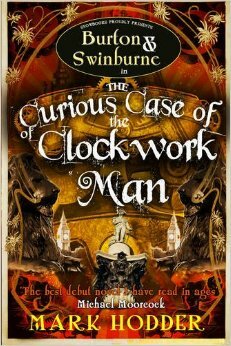 Burton and Swinburne are on the case! I liked this book, but if it were the first the series I am not sure I would have read them all. The story is well-constructed and all the disparate elements end up tying together nicely, but it is more violent than the first novel by far. There are also a few things are just plain icky, and if I hadn’t known that this is not the case in the rest of the series that might have been it for me. Don’t get me wrong, I don’t shy away from a fight scene, but there were just a couple times I couldn’t help but say “eeewww” after reading a passage. I think my favorite part of the story had to be the zombies that come near the end. Zombie isn’t exactly the right word, but I don’t want to give too much away. They are unfailingly polite as they try to eat you, which makes for some hilarious exchanges. I thought Hodder had a very interesting take on a lot of the supernatural elements that often creep into Steampunk and Gothic literature like ghosts and dead people who won’t stay that way. As with many a second book, it has little to do with the first but feeds directly into the third. So stay tuned for my review of the 3rd installment, The Expedition to the Mountains of the Moon.